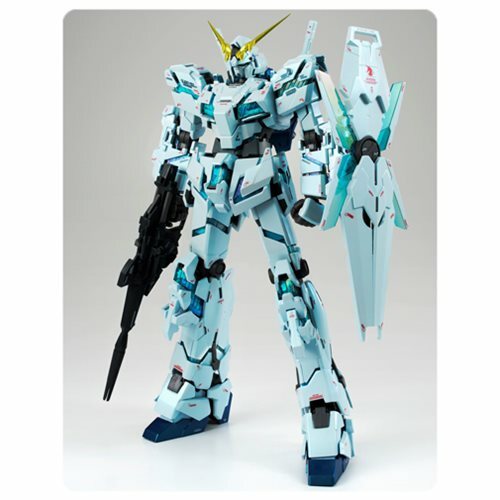 Unicorn Gundam Final Battle Version is joining the Gundam Fix Figuration Metal Composite line-up in tribute to Mobile Suit Gundam Unicorn RE: 0096, completed meticulously in the final battle design! In true GFFMC style, the unique pearlescent IRIS finish is used throughout the impressive psycho frame. Advanced joints make it possible to re-create the memorable shield funnel pose from the anime. Set includes 8 interchangeable hands, beam magnum, hyper bazooka, 3 left and 3 right beam gatling guns, 3 shields, 3 shield funnel gatling joint parts, shield funnel joint parts, 2 beam sabers, display stage set, and stand. Measures nearly 8-inches tall! Ages 15 and up.